There is evidence for bascinets having an attached lower face-plate/early bevor. One illustration can be found in Ashdown1 . Given the cost of a full metal helmet, I decided to have a go at a cuir bouilli faceplate/bevor. 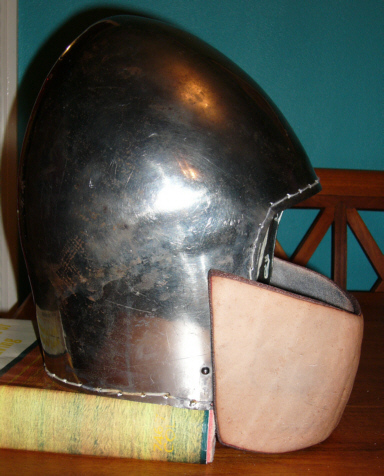 Since there was no pattern available, corrugated cardboard was fitted around the bascinet and trimmed until it approximated the required shape. 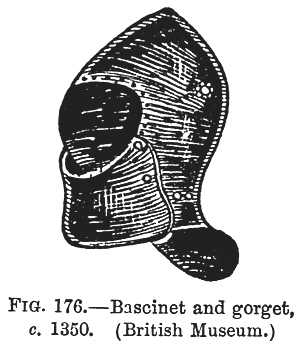 The original bascinets which had this plate also had an extended back to the helmet (see fig 176). This meant that the cuir bouilli plate would sit proud of the base of the current helmet. Bark-tanned leather (3 mm/7-8 oz) cut to shape with an additional 1 cm per border shrinkage allowance. (See Cuir bouilli Project Part 1 - Shrinkage & Strength Experiments for rationale). Pan, water, tongs, rubber gloves, thermometer, clock, and separate container of cold water. The leather was immersed in cold water until bubbling ceased; water heating on the stove. After donning gloves, and then checking and adjusting temperature, the leather was taken out of the cold water and placed into the boiling water (100° C/212° F). Once again, the pan was not big enough to take the entire piece at once, so the leather was progressively rolled through the water along the vertical axis (approximately 2/3rds of the leather was immersed at any one time). Natural curving started to take place as the leather polymerised and this was encouraged by the rolling process. This approach does have the advantage of allowing extra hardening to be applied to specific points by simply holding them in the water a bit longer. As soon as the desired hardness was achieved the piece was removed from the water and placed onto the bascinet and held in place until it cooled. For the initial forming and cooling I wrapped the faceplate around the back of helmet. This was partly to ensure a smooth curve, and partly with the idea of creating some symmetry. As well, the metal helped to cool the shape quickly. Once the curve was partially set the leather was moved to the front and, applying some pressure at the edges, slightly re-curved to fit the angle of the desired slope. Dry faceplate looking up from the bottom of the plate. The slight difference in curve is not an issue as fastening the faceplate to the helmet adjusts this. Side view with faceplate propped in approximate position. Three-quarters view with faceplate propped in position. Compare this with the illustration in Fig 176. Masking taped to helmet to ensure correct placement, then helmet donned; after adjustments made the position marked with felt pen on the steel. I planned to lace the faceplate in such a way as to allow the right side to be undone for easy donning and doffing. Therefore the left side was marked for drilling, matching the holes to holes in the helmet. 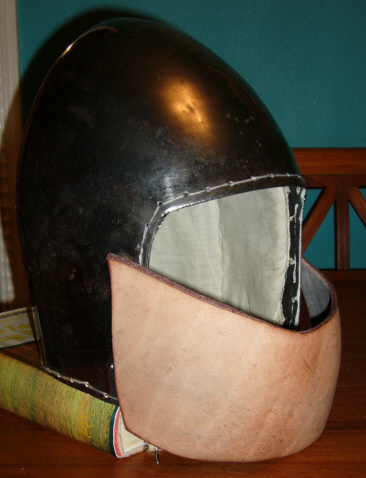 Problem: leather lacing would not fit through as helmet liner already sewn in place as didn't have vervails yet. Swapped to waxed linen thread and sewed left side on. This virtually eliminated the idea of having a removable right side, so after donning helmet to check positioning, the ride side was marked and attached the same way. 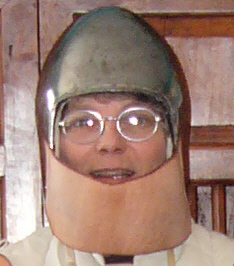 Result: Comfortable to wear as lightweight, and throat area felt much safer. Three-quarters view with faceplate attached and painted. The stitching can be seen here. The faceplate was later removed as too restrictive on breath without protecting the middle and upper face. 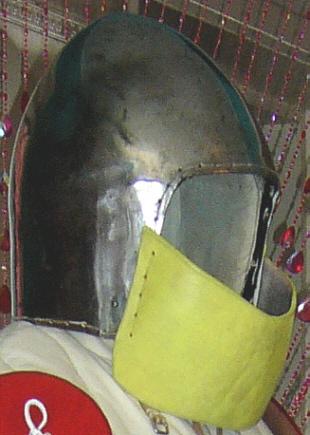 Gorget with throat protection constructed instead (see Gorget project). I will revisit the concept though as it does provide a lightweight and fairly sturdy structure. I am thinking of making a cuir-bouilli visor and adding steel-splinting to reinforce it ...but there are other items to be completed first!